BRONX SUPREME COURT — Lawyers for Dominique Strauss-Kahn asked a Bronx judge Wednesday to toss a lawsuit alleging that the former International Monetary Fund chief assaulted a hotel maid in Midtown last year on the grounds that he had diplomatic immunity. DSK's legal team said that the one-time French presidential frontrunner's immunity stemmed from a UN convention that granted the protection to heads of international agencies. But lawyers for the former maid, Nafissatou Diallo, argued that Strauss-Kahn lost his immunity when he resigned from the IMF in May 2011, months before Diallo brought her suit. The judge, Douglas McKeon, promised to “expeditiously” decide whether to uphold the motion or allow the case to move to a jury trial, though he did not give an exact date for his decision. 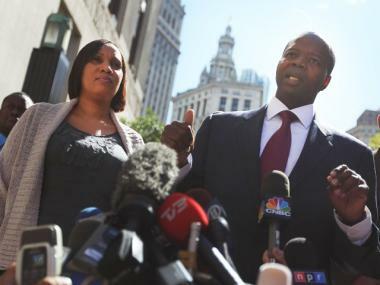 Nafissatou Diallo, left, the hotel maid who accused former IMF director Dominique Strauss-Kahn of sexual assault, stands with her attorney Kenneth Thompson after a meeting at the Manhattan District Attorney's office on August 22, 2011 in New York City. 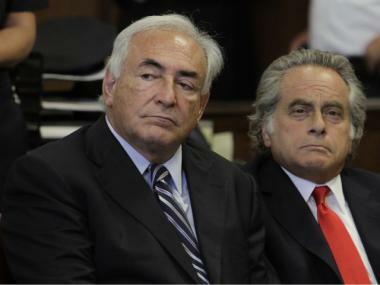 After the hearing at the Bronx Supreme Court, which neither Diallo nor Strauss-Kahn attended, Diallo’s lawyer called the motion “a desperate attempt” to keep the case out of court. Strauss-Kahn’s attorney, William Taylor III, later insisted that Diallo’s suit was inspired by money. “It’s very clear that Ms. Diallo would like to have more money than she does today,” he told reporters outside the courthouse. In August, a Manhattan judge dismissed a criminal sexual assault case against Strauss-Kahn after prosecutors said Diallo had lied about her background and changed her account of the incident, which damaged her credibility.